London (AFP) - Raheem Sterling, Leroy Sane and Yaya Toure scored as Manchester City secured their place in the FA Cup fifth round with a 3-0 win at Crystal Palace on Saturday. 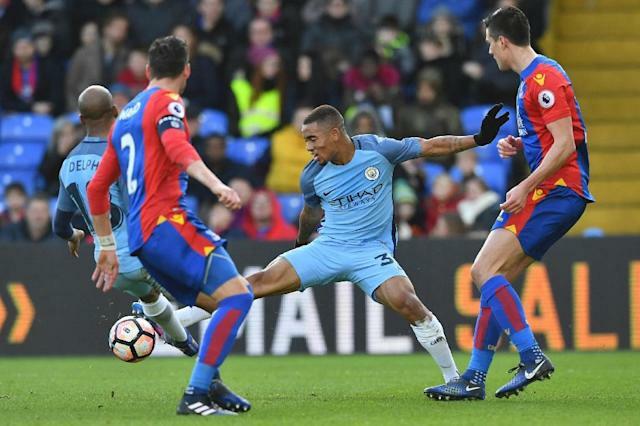 Gabriel Jesus, City's £27 million ($33.9 million, 31.7 million euros) signing from Palmeiras, marked his full debut by setting up Sterling for City's opener shortly before half-time at Selhurst Park. 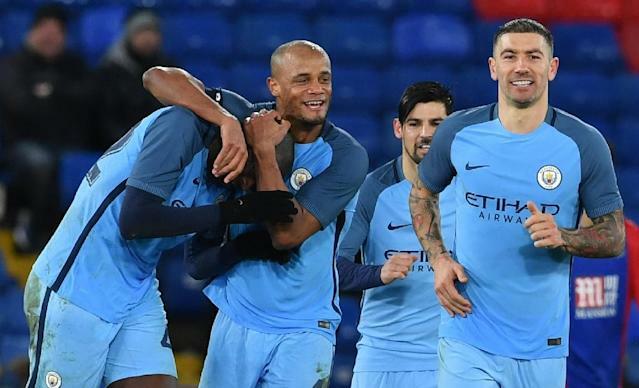 Sane and Toure struck late on to rubberstamp a win that got Pep Guardiola's side back to winning ways after their 4-0 thrashing at Everton and last weekend's 2-2 draw with Tottenham Hotspur. Defeat ended Palace's hopes of emulating last season's run to the final and leaves them with only their fight to avoid Premier League relegation to focus on. Sam Allardyce has won just one of his first eight games since succeeding Alan Pardew as Palace manager, but having made six changes, he clearly had half an eye on Tuesday's trip to Bournemouth. Guardiola made five changes, which included a first appearance for captain Vincent Kompany since City's 2-1 win at the same ground on November 19, when the Belgian centre-back suffered a knee injury. The visitors began brightly, Sterling narrowly failing to pick out Sane with a cross from the right and Toure teeing up David Silva for a volley that Wayne Hennessey blocked at his near post. Palace, though, began to find joy on City's flanks and for a period during the first half they had Guardiola's men on the back foot. Willy Caballero, deputising in goal for Claudio Bravo, had to field a Jordon Mutch header and produce a smart save to repel a James Tomkins snapshot after City failed to clear Lee Chung-Yong's free-kick. Toure was perhaps fortunate to avoid a red card when, two minutes after being booked for a foul on Joe Ledley, he tripped Mutch as he forged down the Palace right. Referee Mike Jones spared the Ivorian and from Andros Townsend's free-kick, via Mutch's flick-on, Christian Benteke headed over. Jesus had been quiet, but two minutes from half-time he came to life, neatly controlling the ball with his back to goal, turning sharply and freeing Sterling to slot a low shot past Hennessey. The Brazilian almost made it 2-0 on the stroke of the interval with a right-foot shot that was parried by Hennessey, the ball rebounding against a Palace defender and looping over the bar. Loic Remy, a half-time substitute, came close to an equaliser when Mutch's blocked shot bounced into his path and he sent an acrobatic effort whistling over the bar. A Fabian Delph effort turned behind by Hennessey was followed by an almighty rain and hail shower that left the pitch sprinkled with white specks and briefly threatened to put City off their game. After failing to control Caballero's pass, Gael Clichy was robbed by Lee, who fed Ledley, and the Welshman drilled a shot narrowly wide. Ledley would also go close with a diving header from Townsend's cross, but by that stage Sane had put the game beyond Allardyce's side. Silva's pass down the inside-left channel was allowed to find its way to Sane and he shot across Hennessey for his third goal in three games. Jesus squandered a chance to add a third late on, succumbing to an untimely attack of cramp after skirting Hennessey, but Toure did find the net with a fine stoppage-time free-kick.